Last spring, at home in Ontario, Bob and I had fervently hoped to see a Wilson’s Warbler as they migrated through our region to their breeding grounds in northern Canada. 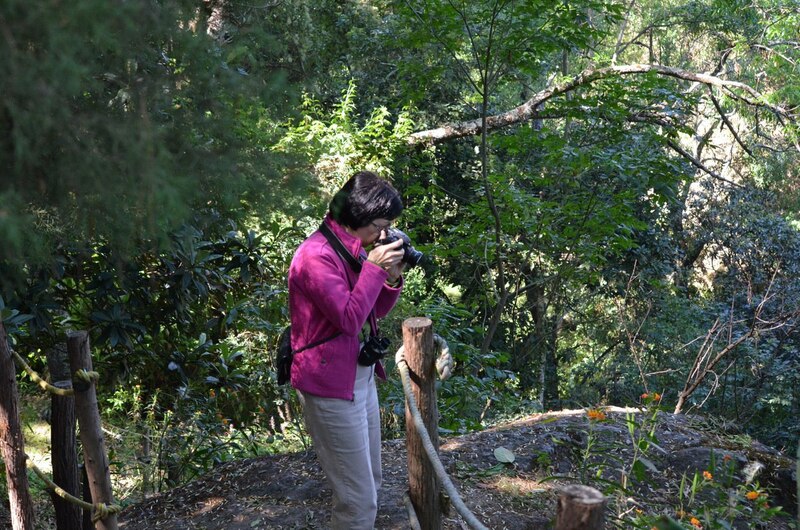 It was a total surprise to spot one in Mexico on our very first day on the ground there, and it was no further than a short walk from our hotel room at Hotel Rancho San Cayetano. 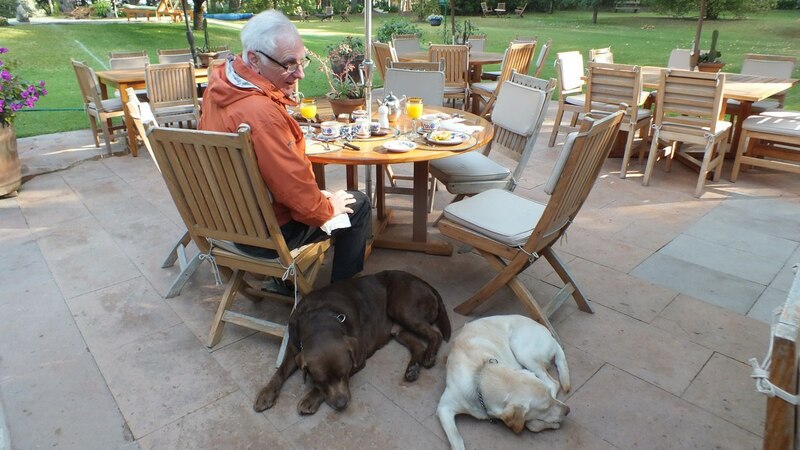 After leaving behind subzero temperatures and blowing snow in Toronto , it was a treat to sit on the hotel’s patio and breath in the tropical scents as we sampled our first taste of Lisette’s breakfast menu, and it didn’t hurt to be kept company by her and Pablo’s two Chocolate Labs. They made us feel as welcome as our hosts did. 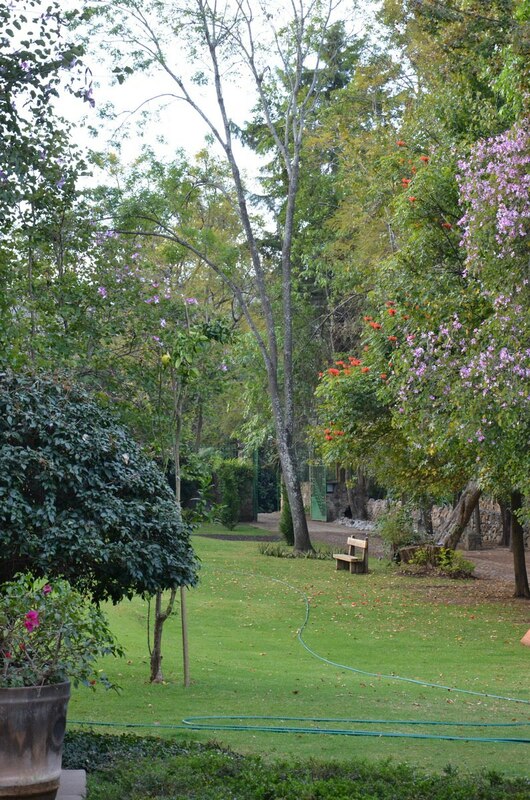 Even though it was mid-January when we visited Zitacuaro, many trees were in bloom, and the soft, green grass invited us to explore the many facets of the hotel’s estate. A simple sign standing erect at the edge of the lawn drew our attention to a narrow path that disappeared down a steep slope, so we figured it must be the trail to the river below. Pablo is an ideal host who engages his guests, and he promptly suggested a hike through the woodlot after learning about our interest in birds. Bob and I did not want to squander even one minute of our time, so we took to the trail like eager children out for an adventure. Birdsong filled the air and floated on the breeze, so it was a challenge to pinpoint the exact location of some of the birds. We didn’t really even know what species we were looking for. 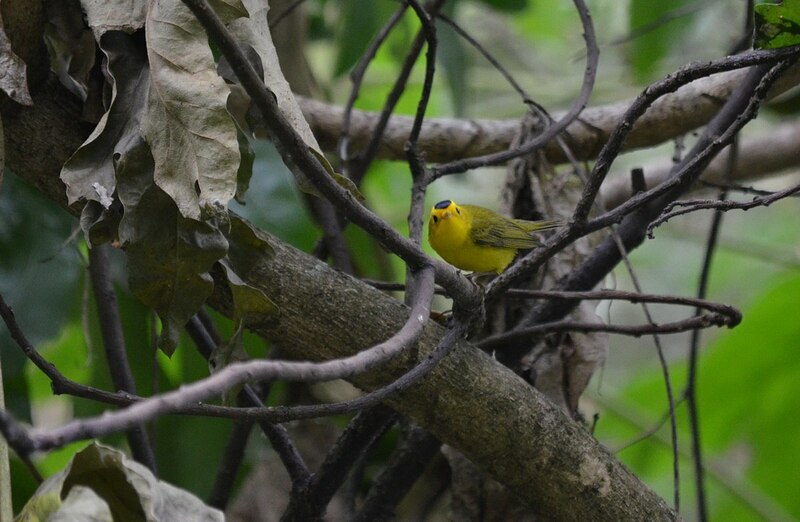 The telltale black cap on the Wilson’s Warbler’s head was a dead giveaway as to the identity of this charming yellow bird. 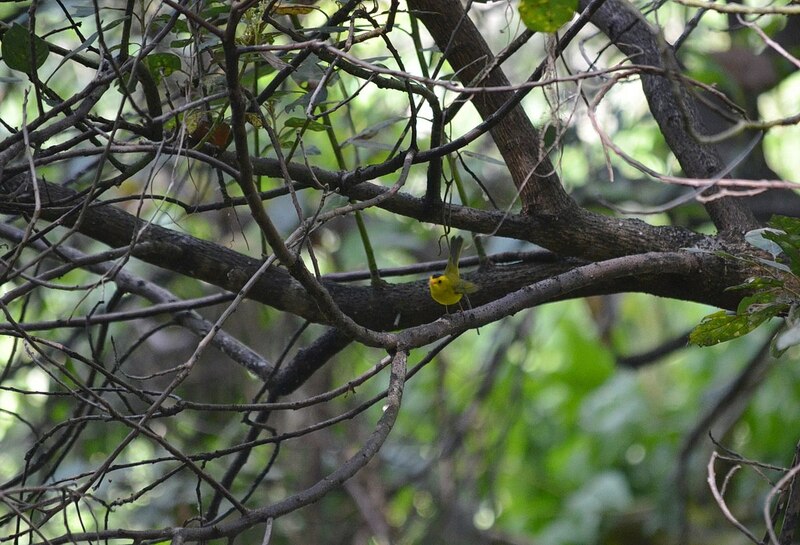 Although we were at eye level with the warbler as we stepped onto the top portion of the trail, a thick tangle of vines and branches obscured our view while at the same time creating an interesting habitat for the songbirds. 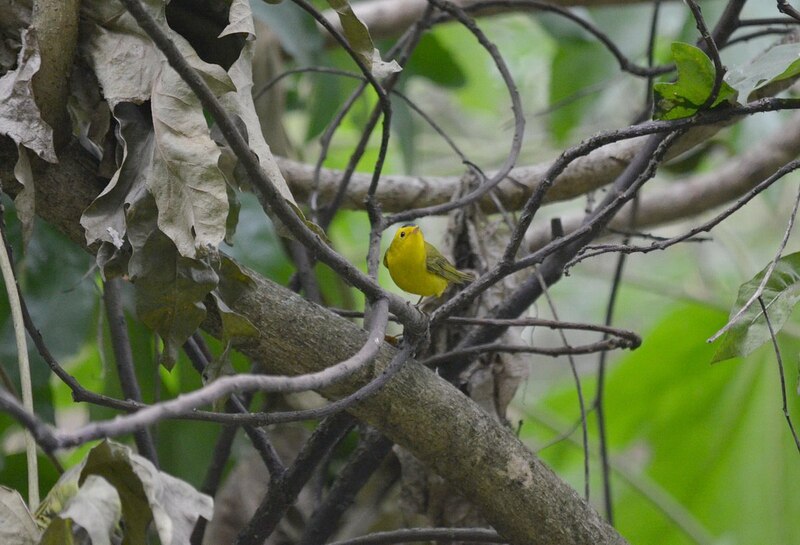 This male Wilson’s Warbler has the solid black cap that is diagnostic for this species, whereas a female would have a duller cap or no cap in some cases. 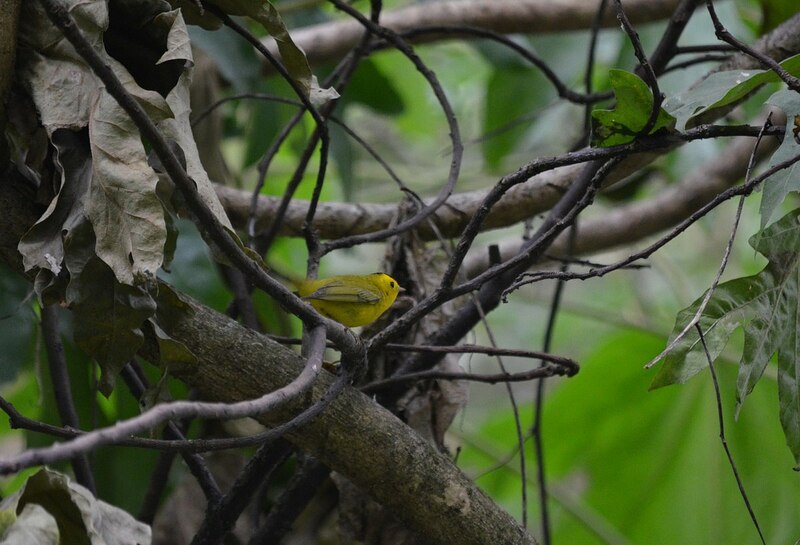 Wilson’s Warblers are perching birds that frequent a wide range of habitats over the winter months, everywhere from coffee plantations to scrubby fields, pine-oak forests to tropical evergreen stands, but always they prefer a riparian habitat such as that found at Hotel Rancho San Cayetano. As Bob and I observed this Wilson’s Warbler, it hopped from branch to branch, flipping its olive-brown tail frequently as it went along. This is standard behaviour for these birds when they are searching for food. These sprightly warblers move rapidly when foraging, and it is in winter that they are more prone to hunt for insects in tall trees rather than lower bushes. Bees, aphids, spiders and caterpillars are some of the chosen prey which the birds glean from leaves and twigs. 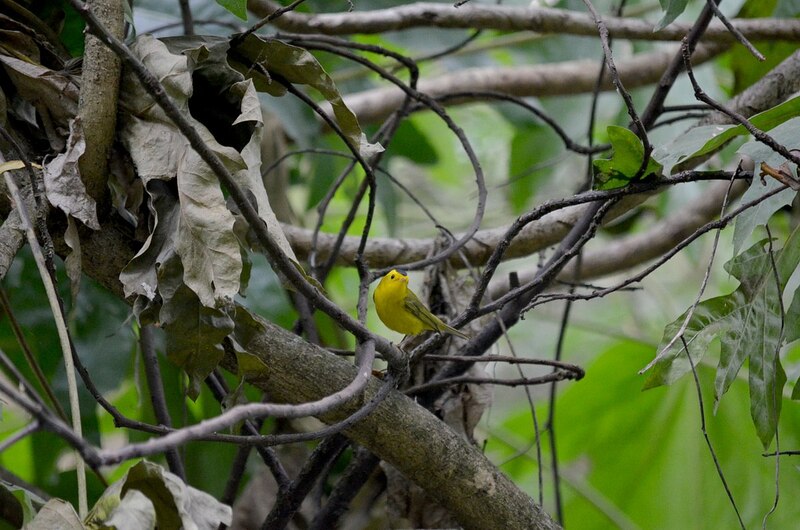 Wilson’s Warblers are small, bright yellow warblers with an olive-green back and slightly darker wings, and their large, black eyes stand out against their cheerful yellow faces. The species is widespread, and between breeding, migration and wintering ranges, these birds cover nearly the whole of North America. 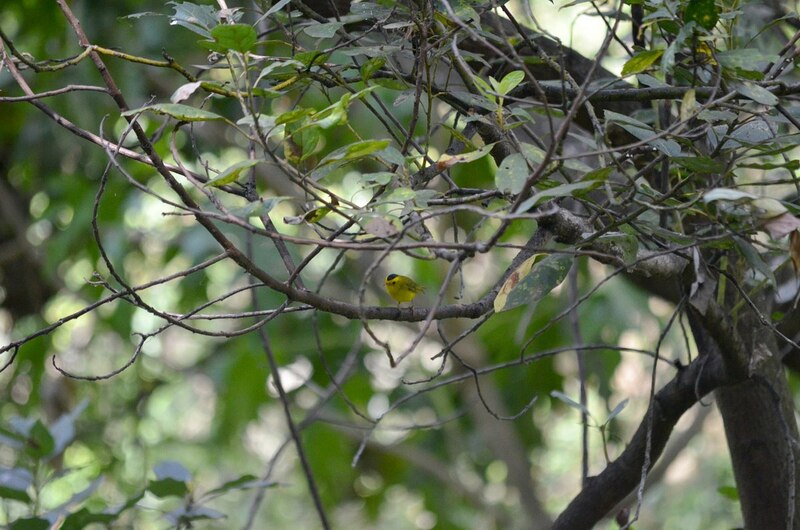 We were very happy to be able to count this as one of our newly-sighted birds. They were very friendly, Blake. Choco and Latte were their names, and they really appreciated a good tummy rub or ear scratch.